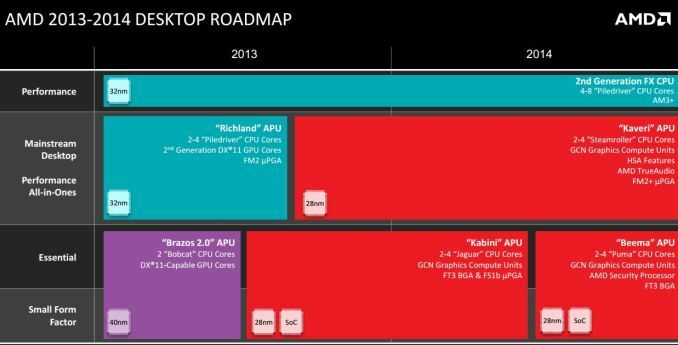 AMD announced earlier in March that it would be launching a socketed desktop Kabini APU. 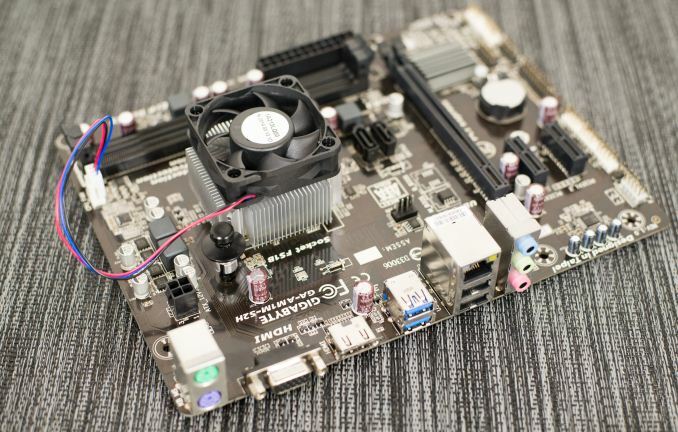 Traditionally the ultra low end/low power SoCs on desktops have come in packages soldered on to motherboards. If you need a faster CPU, you bought a new motherboard with it. With its new AM1 platform, AMD hopes to bring the sort of flexibility enjoyed by the rest of the desktop market to the entry level value segment. The rationale is simple: the traditional desktop PC is under tremendous price pressure due to the popularity of affordable tablets, notebooks, Chromebooks and Chromeboxes. While there are definitely advantages to a desktop, it's a market that won't grow on its own. The one advantage desktops have over any of the aforementioned modern mainstream computing devices is upgradability. 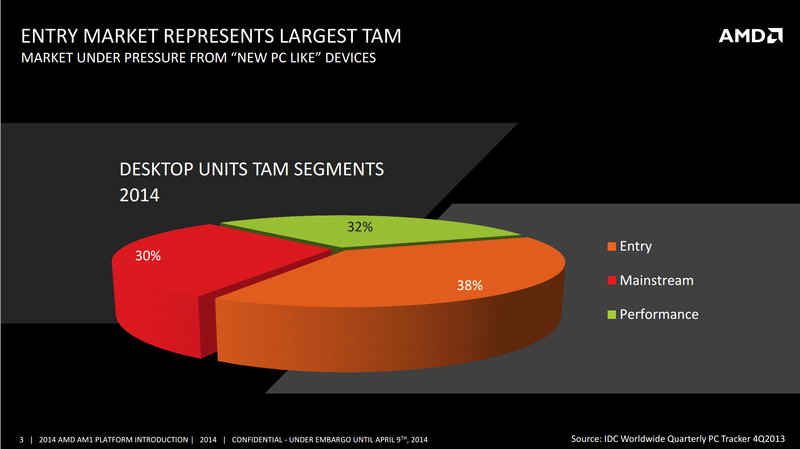 Unfortunately that's a feature that's often lost as we look at the value segment of the desktop market. AM1 attempts to fix that. 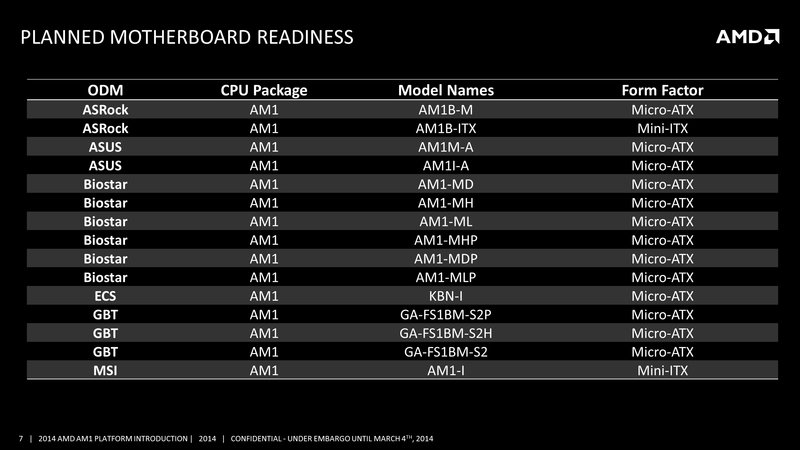 Each of these APUs features up to four 28nm Jaguar cores and a 128 SP implementation of AMD's GCN GPU. We've gone over both the Jaguar and GCN architectures in previous articles, so we won't spend a lot of time recapping them here. Jaguar is the latest in AMD's line of "cat" cores, designed to go up against Intel's Atom. GCN on the other hand is a well known GPU design from AMD as well, cut down here to fit in a much smaller die area (and thermal envelope). This isn't the first time we've seen this Jaguar + GCN combination of course. Kabini first launched as a notebook APU nearly a year ago. 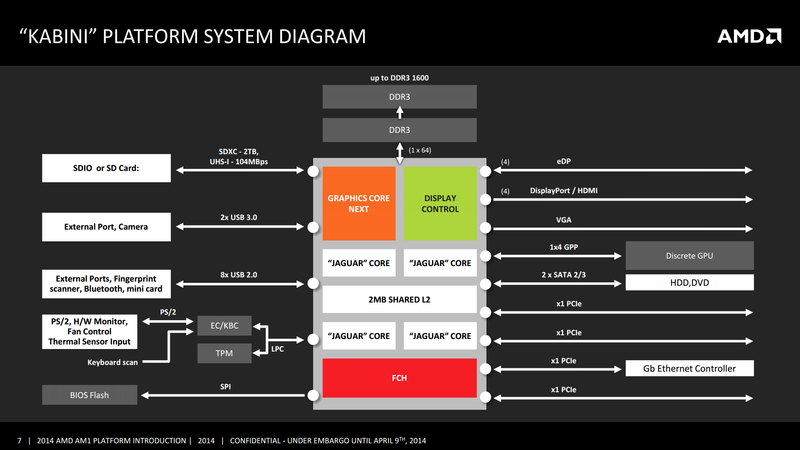 Architecturally we're looking at the very same SoC, even down to running at the same max clocks and at the same TDP. The big difference is what we have here today is socketed and targeted at the desktop. The Athlon and Sempron brands are back and used for AM1 Kabini. 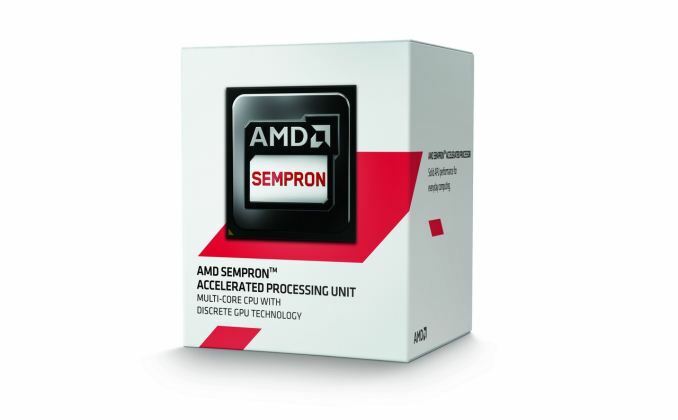 The most expensive AM1 APU is the $55 Athlon 5350, a quad core SoC running at 2.05 GHz with a 2 compute unit GCN GPU (128 SP) running at 600 MHz. All four models will have an official TDP rating of 25W, suggesting that they are all the same die and merely binned according to performance. While the APU costs are low, it's actually the motherboard costs that are most impressive. 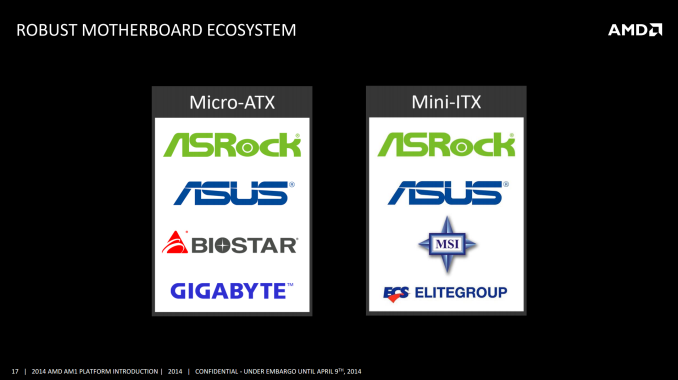 AMD expects mini-ITX and micro-ATX AM1 motherboards to retail for between $25 - $35. At the low end of the spectrum that means you could be looking at a fully integrated desktop platform for less than $60. Obviously you have to add in the cost of memory, storage, PSU/chassis and heatsink/fan but we're still dealing with an extremely low cost solution. 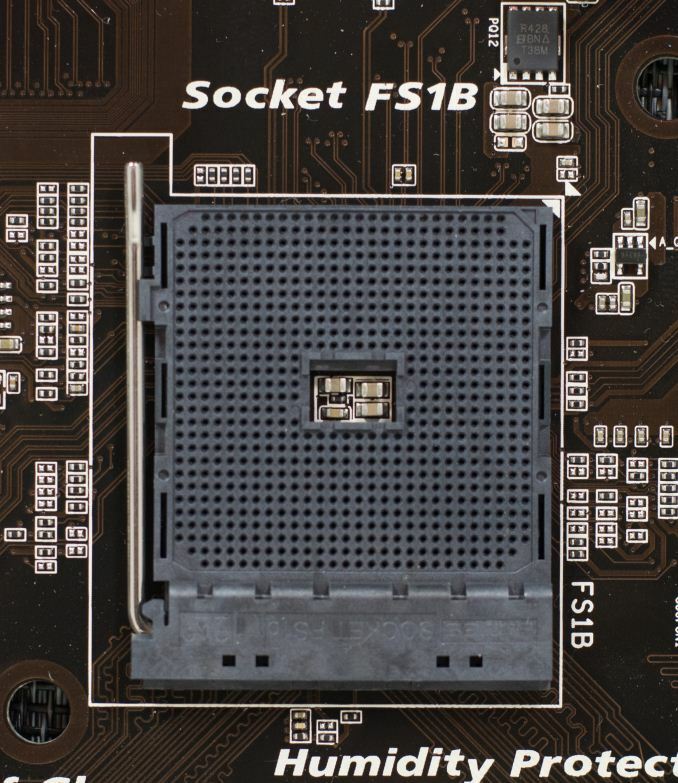 The real value in having a socketed processor is being able to upgrade the chip without incurring the cost of a new motherboard down the road. Unfortunately AMD isn't saying anything about what future APUs will support Socket-FS1b, so for now all we have is what's in the table above. Given the BGA compatibility between Kabini and Beema, I'd assume we might see a Beema FS1b upgrade at some point. However what comes after that remains to be seen. 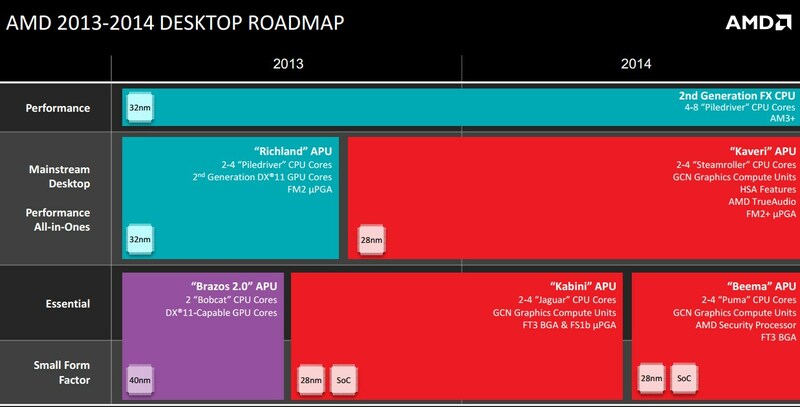 Historically AMD has done a good job of maintaining backwards compatibility with sockets for as long as possible, the one challenge being shifts in memory technology. With DDR4 expected to ship at the high end later this year, the DDR3 based FS1b platform should at least have some life in it from a memory compatibility standpoint. The AM1 platform makes for incredibly simple motherboards. There's hardly anything down on the board itself as Kabini is a full blown SoC with integrated memory, PCIe, USB, Gigabit Ethernet and SATA controllers. Gigabyte threw down an iTE Super I/O chip on the motherboard (beneath the heatsink in the lower left) to add serial, LPT, and PS/2 keyboard/mouse ports. As you can see, Kabini provides a good amount of IO. 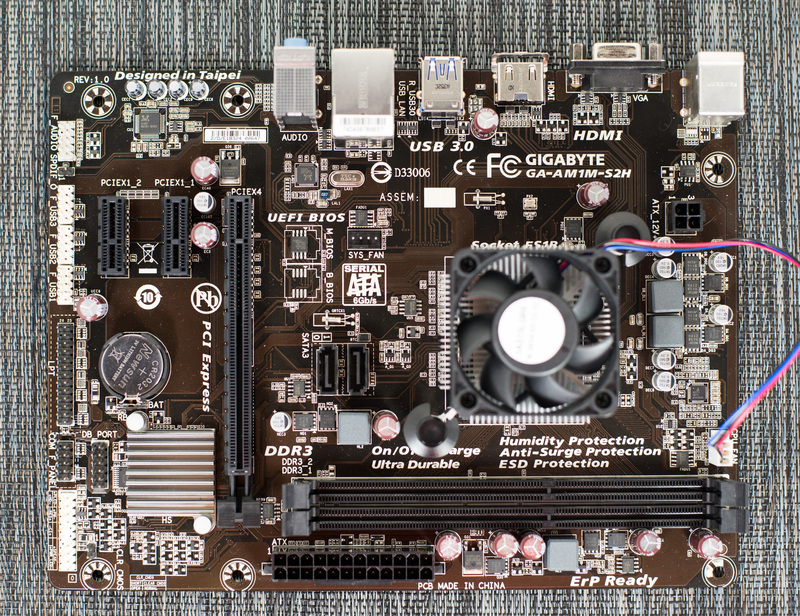 The Gigabyte board includes a single PCIe x16 slot (x4 electrical) and two x1s. You also get two USB 3.0 ports and two USB 2.0 ports on the back header, although the APU itself can support up to 8 USB 2.0 ports. There are also two 6Gbps SATA ports down on the board, the maximum supported by Kabini. The audio solution has to be cheap to be viable, and we get an ALC887 Realtek codec, which is actually higher end than I expected. Realtek are said to offer a discount when an audio codec and network controller are bought for the same product, so it is no surprise to see a Realtek NIC equipped here. Because AM1 is a drive to low cost platforms, I do not see many motherboard manufacturers taking advantage and producing works of electrical engineering art. When the most expensive APU you can purchase for a platform is $55, when a motherboard manufacturer starts considering extra controllers or fancy features, the cost/benefit analysis might go out of the window. An extra USB 3.0 controller might add $0.75 to the bill-of-materials, require extra validation and optimization, then add a final $2.50 to the end-user cost (or $4 after retailer markup). After speaking with Patrick from ServeTheHome about the platform, there is certainly scope for adding several NICs to the motherboard and combining its use both as a PC and a router, however none of the motherboards being released with AM1 at launch seem to have more than one. I was told by AMD that AM1 systems should support memory overclocking above the verified DDR3-1600 speed. This should allow the integrated graphics to stretch its legs a bit more despite the presence of a single channel memory controller should a system integrator consider buying faster memory. Unfortunately at least the Athlon 5350 seems locked to a max multiplier of 20.5x, so there's no hope for easy overclocking of this part at least. Once the products are in the market we will attempt to go over them all in one of our motherboard previews, and perhaps a few in full reviews. With a new socket comes a new heatsink mounting system. Although the rest of AMD's desktop sockets still rely on a latch + lever retention system, Socket-FS1b moves to a push-pin design similar to what Intel uses on its motherboards (albeit with fewer mounting holes, and much simpler mounting/removing due to lower retention force requirements). 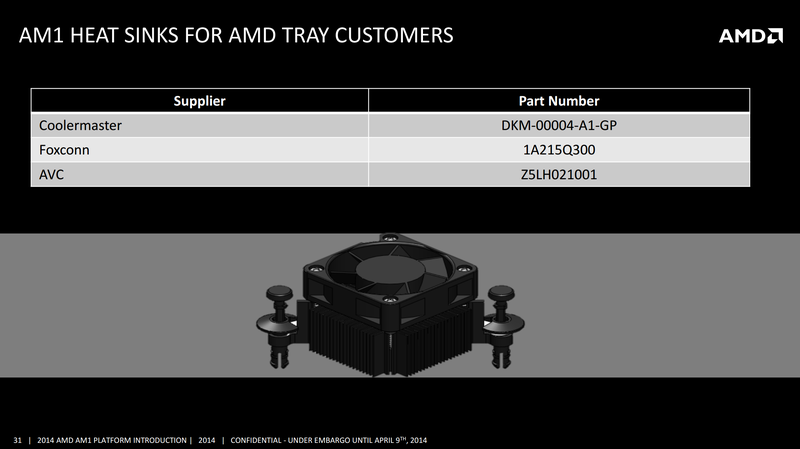 At 25W TDP, we might have been hoping for a passive solution, and I am sure that one of the CPU cooler manufacturers will make one, but AMD is playing it safe by using a small active low profile stock cooler. I would hazard a guess that this is an all aluminium construction in order to keep costs down. The reference AM1 HSF is oddly reminiscent of what old "high end" CPUs used to use years ago. Power delivery to the socket is minimal for a 25W APU, but we still have the requirement for a 4-pin CPU power connector. Most AM1 platform motherboards will be similar to what we have here. Some will ship with DisplayPort/DVI, and others might have an extra USB3/SATA controller. I doubt we will see any with audio codecs above the ALC892, or Killer NICs, although there might be an Atheros in the mix. I know that people are always trying to pair appropriate CPUs and GPUs together to avoid bottlenecks, but the honest truth is that a lot of people just leapfrog their builds every few years alternating between CPU and GPU upgrades. I don't know many people that buy/build a completely new system every 2 or 5 years. I know it happens plenty, but I know a lot of people running Conroe-era CPUs with modern GPUs. Up until a year ago, I was running an old GTX 470 on my 3570K. If money were no object, I would constantly be upgrading, but for now I wait until I absolutely need to. I always tell people to go a little overkill on the CPU in case later on they upgrade the GPU.. mostly because they wont be gaming on it most the time and i think its money better spent and later it won't give you much of a CPU bottleneck. Also because if you got a i7 from 6 years ago (yeah, they came out in 2008).. it would only be about 15%-20% slower. But a GPU that was $300 6 years ago lol, yeah right... a HD 3850 from around 6 years ago is about 1/3 the speed of a HD 7850 and twice the price. So over time a CPU holds it value and GPU can drop from year to year by up to half (for the high end models). i'd still go with a fast i5 instead of i7, except i've really got money to burn. i5 is where you get the best bang for your buck at intel, with a level of performance sufficient for the following years. paying 50% more for 10-20% increased performance doesn't seem very effective to me. this might have been a bit different with the first core-i CPUs. You may think that going "a little overkill on the CPU" may be a good suggestion, but it is not. I found over the years that it is better to spend on the storage system and memory. Back in 2012, I went with a i3-3225. I could go with an i5-3570 processor. That i5 processor will be a little overkill of what I do. The cost of that i5 processor just gives me a lot of grunt that I will rarely will use. That i5 processor will cut in my budget, so I can not go with a good storage system and/or go with a decent size of memory. If I add a graphics card, the med-end graphics models would not be bottleneck by my processor. If I go with a high-end graphics models, then yes the processor that I picked will bottleneck the high-end graphics card.